When Snappit launched in 2011 it quickly became a pioneer with the mobile ordering solution targeting the F&B industry. Since then, a lot has happened – Technology has evolved extremely quickly and in its path, it has pushed the need for mobile based hospitality and ordering experiences even further. As a company, we want to be the go-to solution for the F&B industry and to push our ambition forward we have decided to reinvent ourselves. We hereby pleased to announce a new look and name. 1. A scalable mark that can convey the feeling of the full logotype in constrained spaces. 2. The incorporation of a playful personality with emphasis on hospitality. 3. A modern and technological touch. With that brief in mind, we still needed to understand these key points. First key point is quite easy to specify since it’s required in almost any modern brand identity that lives cross platform. Second key point was the most difficult of the points. How do you define hospitality? Where does it originate from? What does playful mean? What does a brand personality entail? For several weeks, we weekly tried to pin down that specific key point. However, quite early in the research phase we stumbled upon several articles describing how a pineapple was a symbol of hospitality back in the colonial age. This symbolism prevails to this day as is also seen in architecture and interior design, especially in restaurants, hotels and other hospitality industries. Even though we investigated different paths, we couldn’t get the pineapple out of our heads. It was perfect. It had everything we wanted. A centerpiece in the history of hospitality and already broadly present in everybody’s lives giving the pineapple a top of mind recognition. It’s sweet, it’s sour, it’s both loved and hated on pizzas, it’s a dessert, it’s a salsa. Last key point became represented through the use of bright colors, geometric shapes and a bold human sans-serif logotype. By utilising geometry into the logomark, the logomark would be perceived more technological and modern. 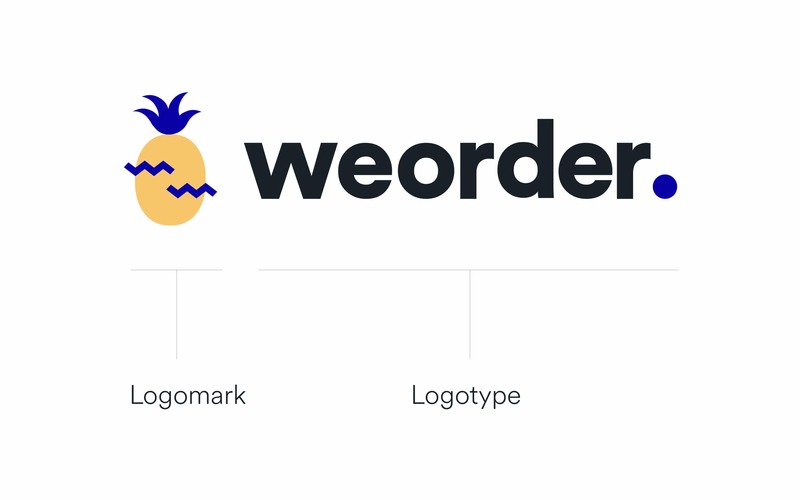 The process behind the pineapple mark was a shared process among many in the Weorder team. We wanted to create something we all could be proud of and something we believe represents us as a team in the best way. Based on a minimal and abstract approach, we designed the logomark to represent a pineapple. The pineapple body and hat are built with circular shapes and the pineapple pattern on triangular shapes. 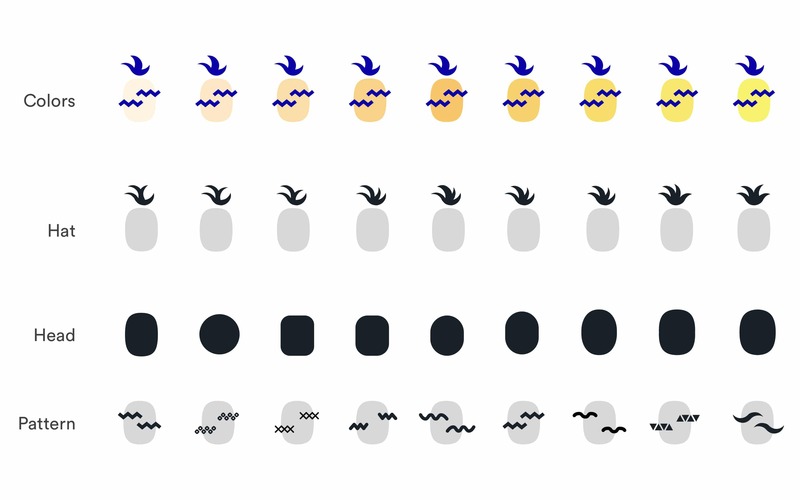 To make sure our abstract and minimal logomark is perceived as a pineapple, we needed to implement either the green or yellow colours from the fruit. Lots of different variations were in play. However, we wanted to stay true to our Snappit legacy branding hence the use of blue in our logomark. To find a good balance with the use of blue and yellow, we updated the traditional Snappit blue with a playful touch of purple and with less saturation. Emojis are our modern way of expressing feelings and emotions through text. When texting something sarcastic here the use of an emoji comes in handy. 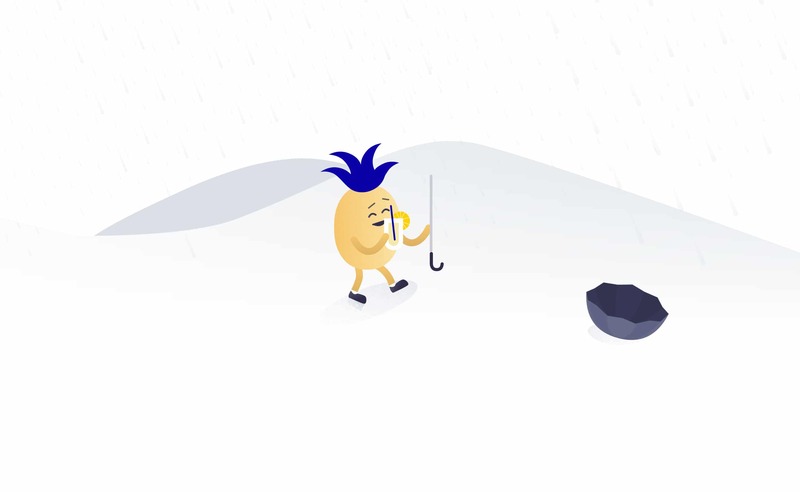 To further improve the personalisation of our brand, we explored the possibility of pairing our logomark with emojis. 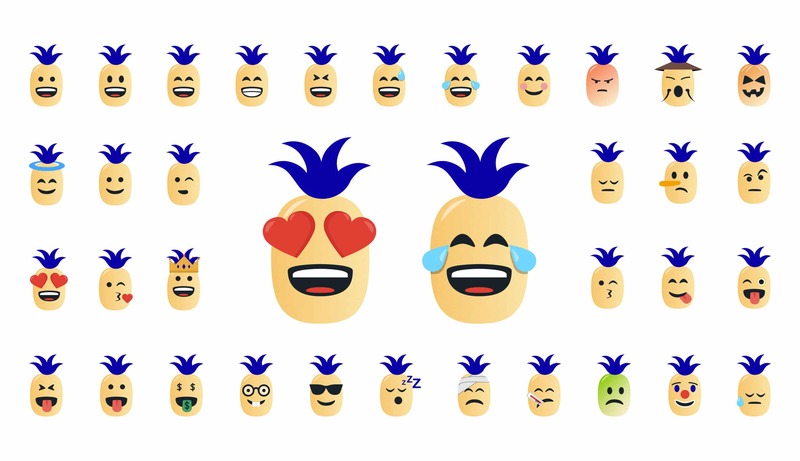 In this sequence, we created our very own twist to emojis, by inventing pineapple based emojis called Pinjis. Going forward, our aim is to use Pinjis as an integrated part of product updates and we are super excited to see how our users are going to make use of them. 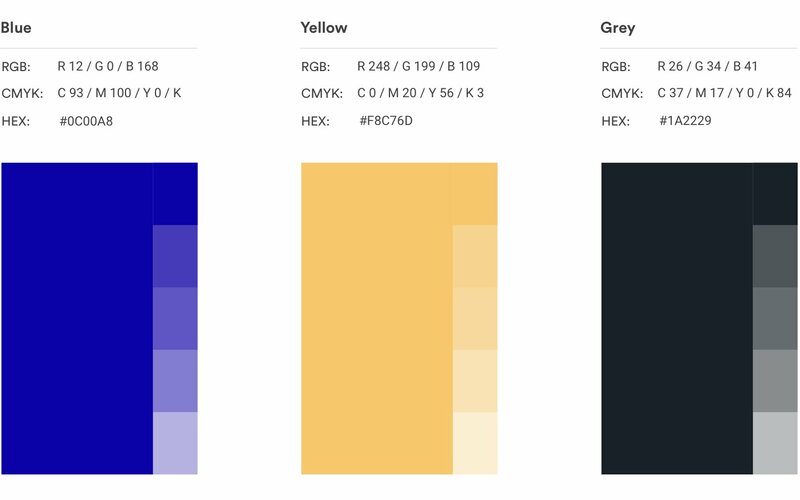 The pineapple mascot will be present throughout our platform in a flat style, with a few gradients and some grain for adding depth. A big part of our branding is using illustrations as imagery instead of photographic images. We believe that illustrations are friendlier and can thereby provide a more consistent and unique touch to the Weorder platform and brand. To finalise the Weorder brand we added another typography to our brand palette. 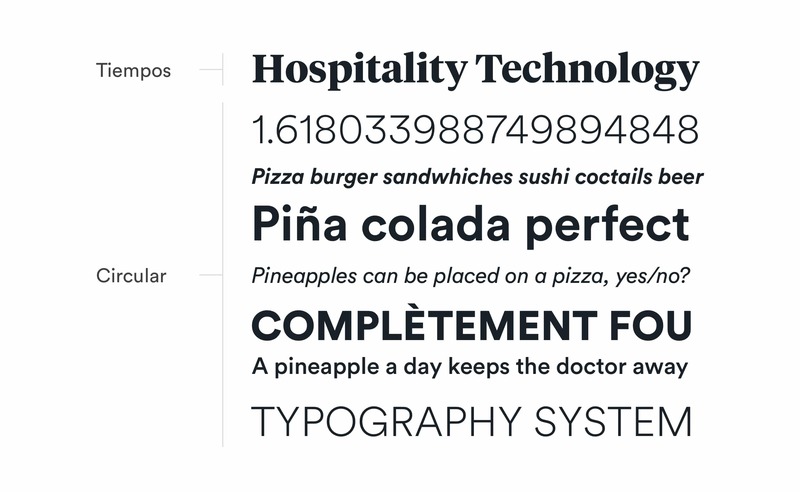 With the introduction of our new typography, Tiempos, we now have a more complete and versatile typographic system. Tiempos will mostly be represented for blog posts and on our marketing platforms. In these cases Circular will be implemented as a body text and Tiempos as bold headlines. Our product will continue using Circular as a user interface font. You’ll see the new Logo and Icon roll out across our apps and services during the following weeks and months. We look forward to introducing more soon and hope you guys are just as pleased with the new brand, as we are.